Have you seen the world? Show us! This fall we’re looking for the best videos from your time abroad! Submit up to two videos you believe epitomize life abroad, feature a USAC program site or USAC activities, tell the story of study abroad, show the impact study abroad can have on an individual and/or a community, and/or encompass the overall experience that is studying abroad. Videos showing what it’s like living abroad, learning abroad, and adapting to a new country, culture, and/or language. Videos highlighting the culture, including but not limited to, cultural differences, celebrations, language, etc. Videos showcasing the unique courses and academic opportunities you had abroad. Videos showcasing the internship and volunteer opportunities available abroad, the impact you had, and the impact it had on you. One winner will be selected from each category and will receive $150 Frosch Travel Voucher and USAC swag for a total of four winners. One grand prize winner will be selected from all entrants and will receive a $300 Frosch Travel Voucher and USAC swag. 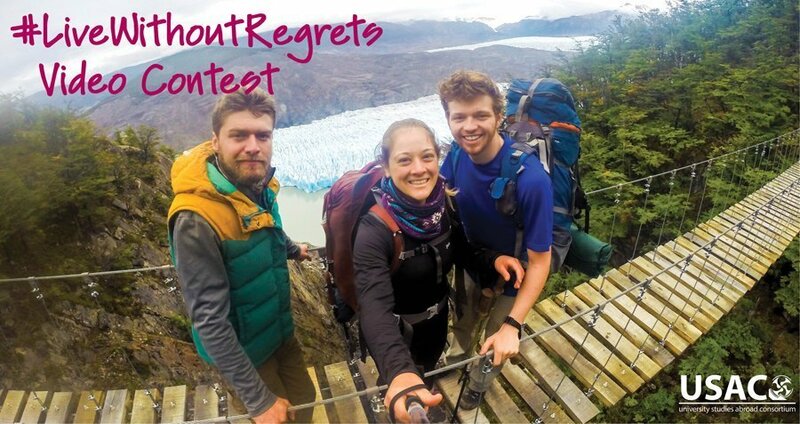 This contest is open to all students and alumni who have participated in a USAC study abroad program. Entrants must be residents of the United States. Videos must be submitted by January 5, 2018. Limits on Submission: Participants may submit a maximum of 2 videos. The video must be a minimum of 30 seconds and a maximum of 4 minutes. The video must be submitted in its native file. Links to videos uploaded to YouTube or other social sites will not be accepted. Ensure all videos attached are in their original file size. Only photos in the following formats will be accepted: MOV, MP4 (MPEG4), AVI, WMV, FLV, 3GPP, MPEGPS, WebM. Aspect ratio: Only horizontal, landscape videos will be accepted. A 16:9 ratio is preferred, but not required. Videos containing alcohol, illegal or dangerous behavior, or anything else that may be deemed as inappropriate, will be disqualified. Original Work: Submitted videos must be original material taken by the contest entrant. By entering this contest, participants acknowledge that the submitted video(s) is/are original works created solely by the entrant and that no other party has any claim to the submitted video. Music: Any music used in the video must be public domain. USAC may retain copies of the video for archival and promotional purposes. USAC employees and interns: Employees and interns can enter the contest, however, no project or videos previously assigned or submitted to USAC can be enter in this contest.